An idyllic village in Goa , a river named Maupsa floating right across the street. 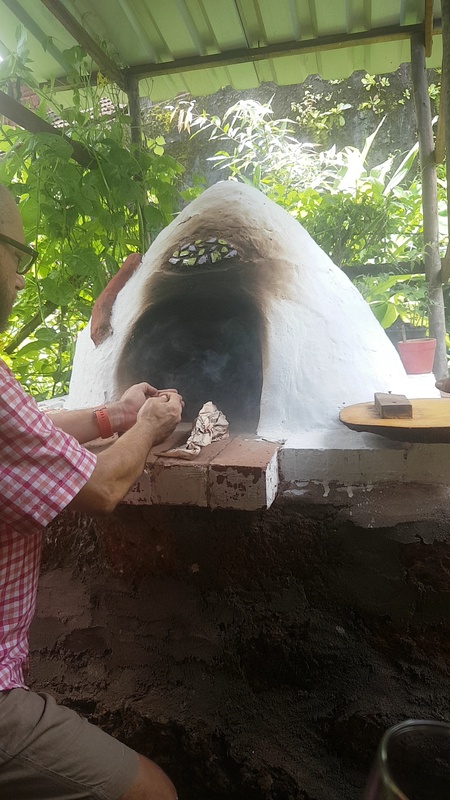 A street lined with Goan bunglows roofed with mangalorian tiles. Coconut and palm trees swaying with the wind, a quiet solitude filling the air and people living in a sense of timelessness. Walking down the street with the pitter patter above our heads, exhilarated and full of zeal and the sense of adventure. We walked to the house an old colonial goan bunglow, plants everywhere, mangalorian tiled roof, white sheer curtains, an old armchair in the veranda and everything that felt Goa. We were greeted by the warm smiles of the Sumitrans and their playful puppy who jumped around excitedly. She came and sniffed and jumped around us and gave us such a warm welcome. We were joined by a few more people all doing soo many different and exciting things. One the head of Auroville Bakery , 2 young vibrant girls in the media industry and another enterpreneur. Along with my mum who is a surgeon. It was such an interesting amalgamation of people, from different walks of life , but with one common mission. To bake a good loaf of bread. We started with the autolyse and fermentolyse. We used a Bavarian Black Death starter for this. Then onto breakfast. A hearty breakfast of idlis and sambar. The star of the show being the spicy and delicictable chutney Molaga Podi , which we couldn’t get enough of. Jiggling to the sweet sounds of the goan music in the background, we started the stretch and fold. The dough wet and gorgeously alive as usual. Huge bubbles started to appear showing signs of life. Every stretch and it felt more extensible , every fold and it felt more supple. 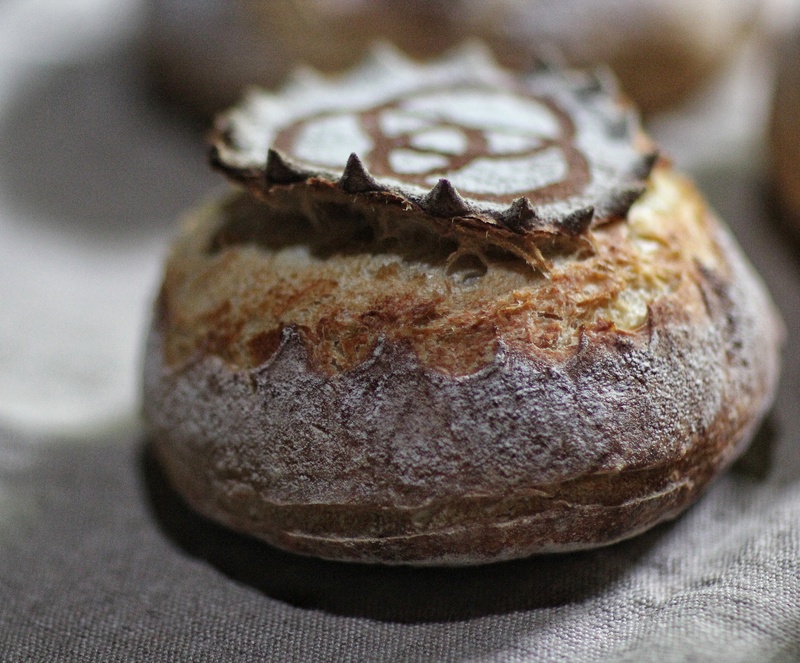 We managed to shape them into some gorgeous boules and put them into the fridge to prove. While chatting about levain and surgery, we sipped on some white wine sangria, exotic and fresh, flavoured with some vodka,apple and orange and undertones of basil. We also snacked on some beautiful crackers flavoured with some rosemary, zátaar and some coconut oil, as we worked up our appetite for their gorgeous food. We were then served lunch, a lunch that was beyond delicious !! 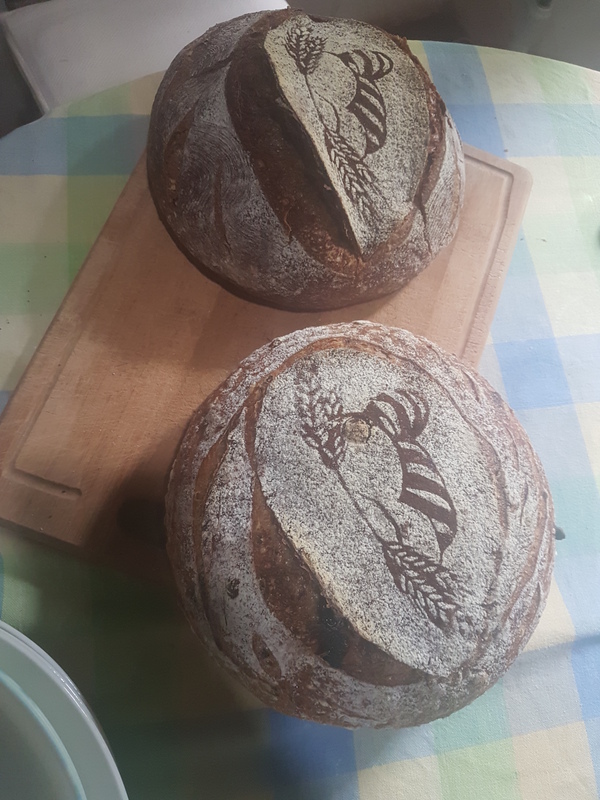 They made 2 boules, one was a raw banana, whole wheat and regular flour. It was lightly brownish in colour , with a hint of green. The other was a berry seedy bread, filled with a sumptuous mix of sunflower, chia, melon, flax seeds . Blackcurrants and cranberries added in for an extra tang and punch of flavour. 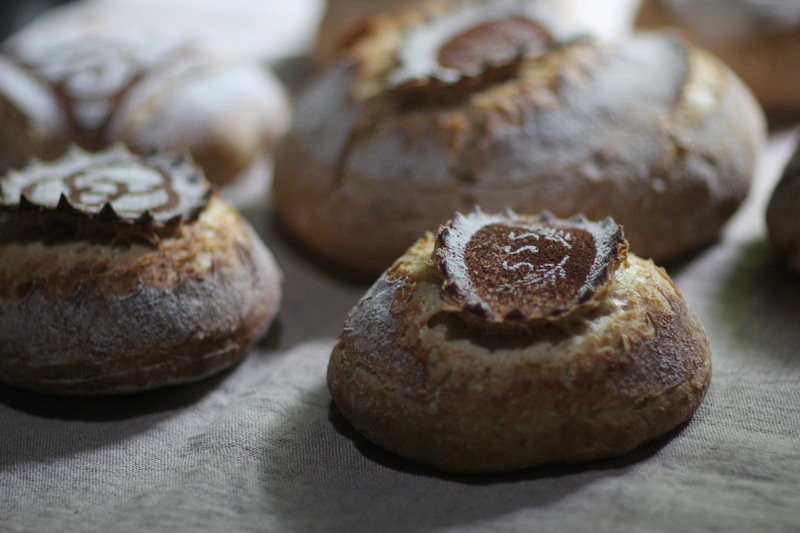 Both boules looked divine, with the perfect ears, golden brown colour and ready to eat. They were combined with 2 Curries from Kerala , full of spice and flavour, 1 was a vegetarian coconut based white curry and the other was a reddish orange prawn curry. They were spicy and tangy, creamy and flavourful ! With a burst of different flavours in our mouths , we were beyond satisfied. We gorged and gorged until our tummies could take no more. We were happy and satiated. We then went on to scoring our boules. First dusting with cocoa powder and putting the stencil, then dusting with flour. Then we scored them with lames and scissors and blades. Finally into a dutch oven and then into their woodfired oven all fired up and ready to bake. We waited patiently and finally the boules were out. Complete with ears and crowns. A gorgeous brown and gold colour , the cocoa turning into a deep brown. Crusty and delicious bread. We couldn’t wait to eat them ! Such a satisfying feeling it was making them and gorging on them ! We clicked a few pictures , made a few memories and enjoyed the goan hospitality. Rustic delicious bread , with that perfect crust and that gorgeous crumb! Crusty on the outside , soft, slightly chewy on the inside. The goan curries spicy , tangy creamy and soo tasty ! Absolutely heaven !! What a great teacher Sujit was, who taught us soo well and with his heart ! And he was perfectly complimented by his wife and family who made us feel soo welcome!! 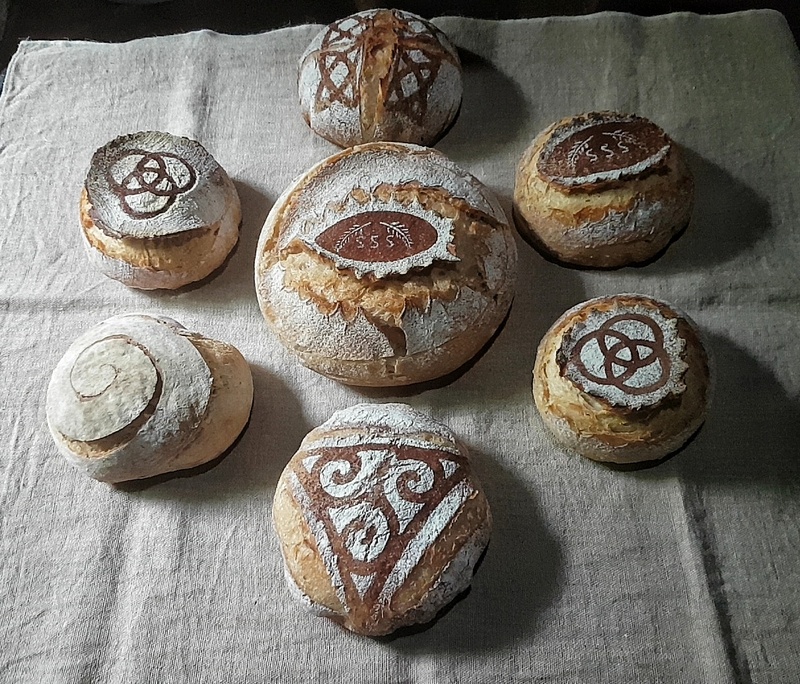 What a day spent with so many interestimg souls, all from different parts of the country , sharing many a laugh, sipping on sangria , snacking and eating away and of course making some seriously delictable bread!